NASA's NEOWISE mission has detected one definite comet that will pass by Earth in the first week of 2017, as well as a second celestial object, which could be either a comet or an asteroid, that will also fly by. The "New Year's Eve Comet" that's been streaking across the sky this December isn't the only otherworldly visitor ringing in the new year in Earth's neighborhood. Wednesday (Dec. 28), NASA's Jet Propulsion Laboratory tweeted a video about Comet 45P/Honda-Mrkos-Pajdušáková, which has been growing more prominent in the sky since Dec. 15. On New Year's Eve, the comet will be visible through a telescope or binoculars near the crescent moon, sporting a blueish-green head and thin, fan-shaped tail, NASA researchers said. The first comet of the New Year, called C/2016 U1 NEOWISE, was detected by NASA's NEOWISE mission in October and will likely be visible from Earth's Northern Hemisphere during the first week of 2017. "It is moving farther south each day, and it will reach its closest point to the sun, inside the orbit of Mercury, on Jan. 14, before heading back out to the outer reaches of the solar system for an orbit lasting thousands of years," NASA officials said in a statement. 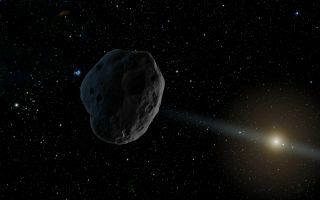 Although skywatchers using a "good pair of binoculars" have a chance of spotting C/2016 U1 NEOWISE as it passes by Earth, visibility depends greatly on the comet's unpredictable brightness, Paul Chodas, manager of NASA's Center for Near-Earth Object Studies (CNEOS) at the Jet Propulsion Laboratory, said in the statement. Comet C/2016 U1 NEOWISE is not considered to be a threat to the planet, the statement said. The NEOWISE mission also detected another celestial object, called 2016 WF9, on Nov. 27, 2016. The object is a dark and relatively large body, with a diameter of about 0.3 to 0.6 miles (0.5 to 1 kilometers). "It's in an orbit that takes it on a scenic tour of our solar system. At its farthest distance from the sun, it approaches Jupiter's orbit," NASA officials said in the statement. "Over the course of 4.9 Earth-years, it travels inward, passing under the main asteroid belt and the orbit of Mars until it swings just inside Earth's own orbit. After that, it heads back toward the outer solar system." Scientists have yet to determine whether the object is a comet or asteroid. Based on its orbital pattern, the object may have once been a comet or it could have originated in the main asteroid belt. However, unlike comet C/2016 U1 NEOWISE, the object doesn't appear to be releasing any gas or dust as it nears the sun, which is a defining characteristic of comets, NASA officials said. "2016 WF9 could have cometary origins," James "Gerbs" Bauer, deputy principal investigator at Jet Propulsion Laboratory, said in the statement. "This object illustrates that the boundary between asteroids and comets is a blurry one." The object is expected to approach Earth's orbit on Feb. 25, 2017, at a distance of nearly 32 million miles (51 million km). Since this is not a particularly close approach, 2016 WF9 is not considered a threat to Earth, NASA officials said. NEOWISE was launched in 2009 as part of the Wide-Field Infrared Survey Explorer (WISE) mission to detect and study comets and asteroids. In 2011, the space telescope was decommissioned for a brief time before it was brought out of hibernation in 2013. "If 2016 WF9 turns out to be a comet, it would be the 10th discovered since [NEOWISE's] reactivation," NASA officials said. "If it turns out to be an asteroid, it would be the 100th discovered since reactivation."